Here’s an unusual item for dailysportscar – but there’s a strong sportscar connection. 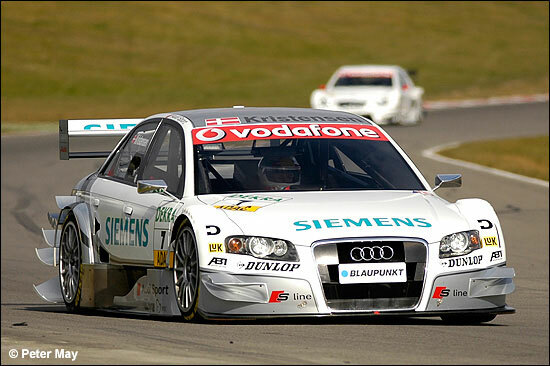 The DTM cars are due to spend four days (Monday to Thursday) at Brands Hatch this week, and Tom Kristensen was among the Audi ‘testers’ – having flown to Europe, from Florida, on Sunday night. "No matter whether I climb into the R10 TDI or the A4 DTM – I always immediately feel that I’m sitting in an Audi,” remarked the four time Sebring winner earlier this week. 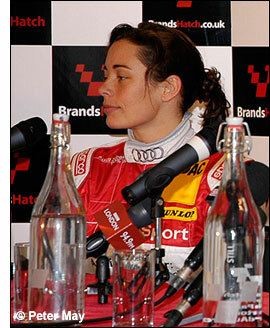 Vanina Ickx and Pierre Kaffer were among the other Audi drivers – although Vanina's car looks slightly odd in the (Peter May) image below, because she crashed on Tuesday morning and the Audi crew had to repair her car using bits from other Audis. Pierre Kaffer is in the silver car - spitting flames (again). 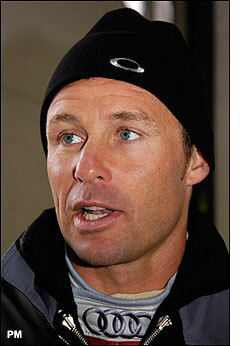 Tom Kristensen was fastest on Tuesday in the Siemens Audi – and on Wednesday. Meanwhile, Allan McNish was having an adventurous time at Sebring, as the 12 Hours-winning R10 was put through its paces on Monday and Tuesday.